Singer 160 Anniversary Limited Edition sewing machine is a gorgeous looking machine. But does the features justify its price? Not sure. Singer 160 Anniversary Limited Edition is the most beautiful sewing machine I have ever seen. Singer introduced this sewing machine as part of their 160th anniversary celebrations. She combines classic looks with modern day technology. Its black color and the glossy finish really gives it a premium look. This is the Rolls Royce among sewing machines. It has 24 built-in stitches which include 12 decorative stitches, 4 stretch stitches, 6 essential stitches and 2 fully automatic 1-step buttonholes. Singer 160 is slightly on the heavier side. It weighs close to 19 pounds. It is not a good idea to buy this sewing machine, if you are thinking of taking it to your sewing class (who would want to take such a premium sewing machine to classes). The stitch length and width are automatically set, but you can change them if you want. The one touch stitch selector makes stitch selection easy. 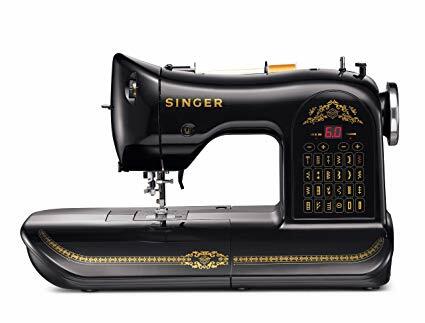 Singer 160 comes with Swift Smart threading system along with automatic needle threader and drop-in bobbin system, which really adds to the ease of use. The presser foot sensor makes sure that the presser foot is in position, otherwise it will show an error message. 14.7 inches arm of this sewing machine makes it easy to work on large projects. It comes with all essential accessories. This sewing machine is covered by 25 year limited warranty as well. This machine comes with a gorgeous bag with limited edition logo on it. The user manual that comes with sewing machine is pretty clear and concise. Singer has done a pretty good job with that. It was not the case with the manuals that came with some other Singer models.Threading Singer 160 was the easiest thing I have ever done. It has a very good LED work light on board, it illuminates the surface quite well. The stitches on Singer 160 are nice and perfect. Stitches are pretty uniform and of highest quality. It is a wonderful machine for quilting, thanks to the large sewing space and drop feed dog feature. The storage compartment is quite large when compared to other sewing machines. Singer could have included a hard cover for such a costly sewing machine. You just get a bag and a plastic cover. There is no needle up/down feature, which is a must for the price. It doesn’t have a lot of built in stitches as well. If you ask me personally, I am not a huge fan of this sewing machine as it is priced really high. Looks apart, it is just a basic sewing machine with few built-in stitches.If you love free motion quilting, this is one of the best you could get in U.S. I am a kind of person who look at even the microscopic details before spending a penny and this machine doesn’t appeal to me. There is a better version of this sewing machine available under the name Singer One Plus. The difference is that it is white in color and has a hell of a lot of features than Singer 160 limited edition sewing machine. It has 221 built-in stitches, needle up/down and many more. It is also listed among Sewing Machine Reviews list of ‘Machines You Can Buy With Your Eyes Shut’. Moreover it costs a lot lesser than Singer 160.